ONE TRAIN - FIVE ENGINES. The royal train, carrying H.R.H. 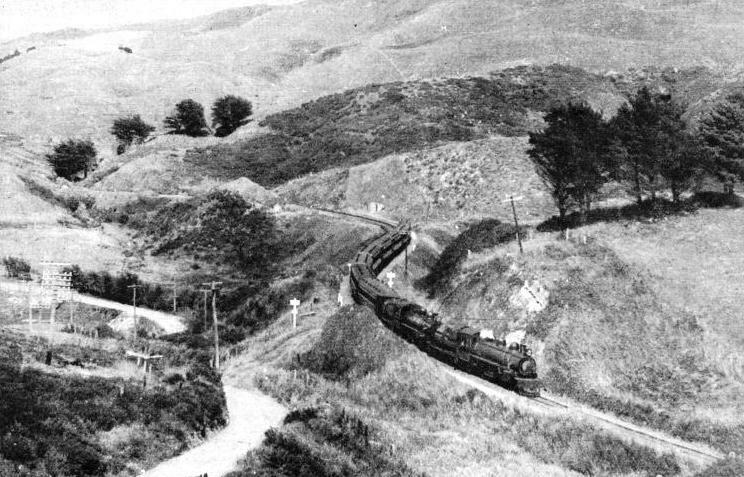 the Duke of Gloucester, ascending the famous incline up the Rimutaka Mountains. This steep climb is accomplished by five engines working on the Fell system. 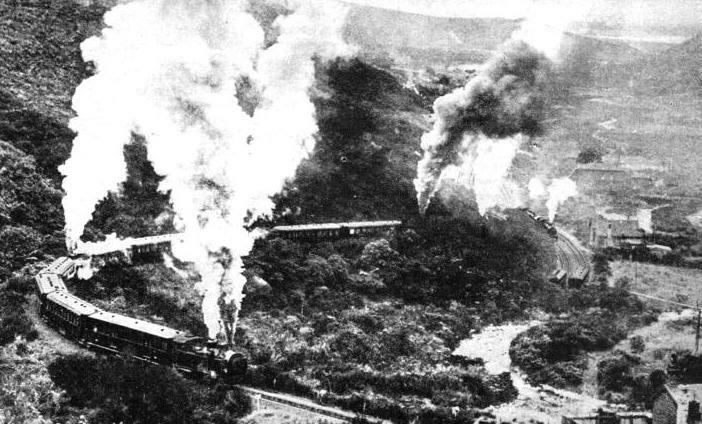 To the right-centre of the picture can be seen the two locomotives which have brought the royal train to the foot of the incline. OWING to the mountainous nature of the country, railway engineering in New Zealand has always been a difficult business. The South Island in particular is a formidable proposition. Mountain ranges, capped with snow and ice, run down its western coast. So impenetrable was this barrier that until recent years the west side of South Island was, so far as railways were concerned, cut off entirely from the east side. In 1923, however, the boring was completed of the famous Otira Tunnel, 5¼ miles in length, and the longest in the British Empire. This links up the eastern and western railways, and makes it possible to travel by train from Christchurch to Grey-mouth. On the main line of the North Island, which connects Wellington, the capital, with the city of Auckland, far away in the northernmost peninsula beyond the Hauraki gulf, fifty miles of track are carried at an altitude of more than two thousand feet above the sea. Deep gorges are bridged by viaducts, some between 200 and 300 ft in height, and the summit level of the line, at Waiouru, 2,659 ft above sea-level, is attained only after some remarkable spiral track construction. During recent years the New Zealand Government, which owns all the railways, has been spending a great deal of money in attempting to flatten some of the steep gradients which could not be avoided when the first of her main lines were laid. For in those early days economy was essential, and the modest resources of the country compelled the laying of the lines with as little as possible in the way of major engineering works. It was for this reason that, almost from the start, a track gauge of 3 ft 6-in was decided on. This contraction from the standard gauge of 4 ft 8½-in is of considerable advantage to the railway engineer. It enables him to sharpen his curves, and so to hug the indented mountainsides closely. In this way he reduces to a minimum his cutting and banking, tunnelling and bridging. But the object is achieved at the expense of speed. If very severe gradients also are included, with a view to avoidance of tunnelling, then the carrying capacity of the line is reduced at the same time. Now that railway traffic has grown in New Zealand to its present dimensions, however, the time has come to increase the speed and the capacity of the lines, and money is being spent freely on improving the old routes, as well as in new railway construction on an extensive scale. One of the original main lines in the North Island of New Zealand possesses one of the steepest gradients in the world worked by adhesion. It is so steep that a special form of traction was adopted at its opening, and this unique method is still in use. To the north-eastward from Wellington, the North Island capital, a railway runs to the Wairarapa Plains - the most prosperous sheep-farming and dairy area in the Dominion. But it is separated from Wellington by the rampart of the Rimutaka mountains, lying athwart the route. 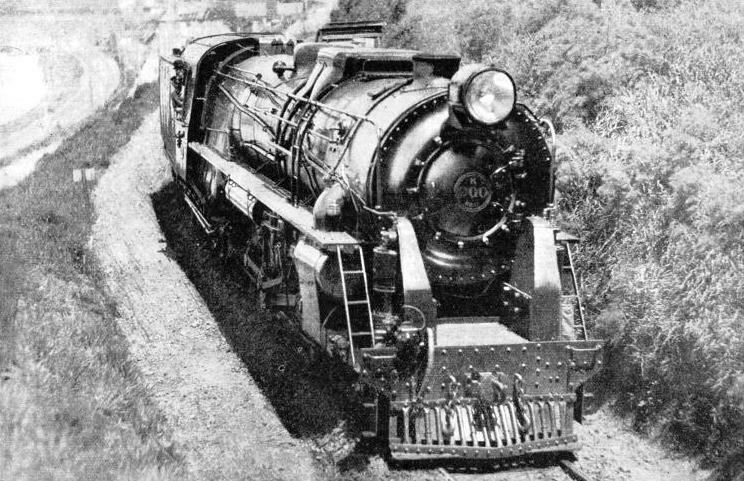 A HUGE LOCOMOTIVE of the 4-8-4 “K” class, used in New Zealand. Engines of this type are of sufficient power to pull heavy expresses up the tremendous Raurimu incline - a four-miles stretch with a gradient of 1 in 50. These engines are of a new design, and are also employed for hauling heavy goods traffic. Thirty-four miles from Wellington the line reaches Cross Creek Station, in a valley which ascends steeply into the heart of these mountains. In the next two and a half miles the line ascends fewer than 871 ft by means of a gradient which is continuously at between 1 in 16 and 1 in 13 - that is to say, twice as long and six times as steep as the climb on the LMS out of Euston terminus in London up to Camden. In addition it is sharply curved; some of the curves being of no more than 330 ft radius. From the first it was realized that to attempt ordinary adhesion working up such an incline with anything like a reasonable load would be impossible. It was therefore decided to use a special system of traction, known as the Fell, which involved the laying of an additional centre rail between the two running rails. This centre rail is in profile like a dumb-bell - similar, that is to say, to a track rail of the type used in this country, apart from the fact that the head and foot are equal in size - but it is laid on its side, instead of in the vertical position. It is secured to heavy sleepers running longitudinally, and these in their turn are fastened to the ordinary transverse sleepers of the track. The purpose of the centre rail is to provide for additional adhesion, and the Fell locomotives, in addition to their ordinary driving wheels, are provided underneath with a pair of horizontal driving wheels, one on either side of the centre rail. By a powerful arrangement of springs, which are of cast steel with flat treads, these horizontal wheels can be pressed into contact with the centre rail when the engine is ascending the incline, and then swung clear while the descent is being made. Because of the steepness of the gradient, it is necessary to use engines which are of comparatively light weight, and the Fell locomotives, therefore, weigh only 39 tons each. They have four-coupled driving wheels in front, and a pair of carrying wheels under the cab, thus being of the 0-4-2 type. Their external driving wheels are of 2 ft 8-in diameter, and are driven by cylinders 18-in diameter by 16-in stroke. There is also a pair of cylinders inside the frames, 12-in diameter by 16-in stroke, which drive two vertical axles, and these, by suitable rods and pinions, are coupled to two other axles on which the gripping wheels are keyed. Brake-power on such an incline as this is of vital importance. So, in addition to their ordinary Westinghouse brakes, the engines are provided with four cast-iron shoes, which by screw gear can be forced into contact with both sides of the centre rail. But even this arrangement is not sufficient, and each train must include in its length a certain number of the special Fell brake-vans. Each van is manned by a guard, who by means of a hand-wheel forces additional brake-shoes against the centre rail, and so assists in the control of the trains when the descent is being made. So severe is the wear of these brake-blocks that in the ordinary course they have to be renewed after every trip down the incline. A RAILWAY MAP of the North Island, New Zealand, showing the main-line routes. It is also important, in ascending, that too severe a strain shall not be put on the couplings connecting the coaches, and the trains are so arranged, therefore, that a locomotive shall be pulling roughly the load for which it has been designed - that is, sixty tons of passenger or sixty-five tons of freight stock per engine. As trains up to 260 tons in total weight may have to be worked up or down the incline, this means that every train on arriving at the foot of the incline at Cross Creek has to be re-marshalled. If it is a passenger train, a Fell locomotive comes at the head, followed by two bogie coaches; another locomotive has two or three more coaches, and so on down the train. A string of Fell brake-vans brings up the rear, until the complete train, if of the full weight, has at least four locomotives distributed at intervals throughout its length. In descending the incline, the brake-vans are, of course, even more important than the locomotives. Then a train of the full weight of 260 tons must be provided with at least five of these vans and two loco-motives. A certain amount of light running of engines and brake-vans takes place on the incline, both up and down, to balance the train workings. No greater speed than six miles an hour is permitted in ascending, and nothing higher than ten miles an hour in coming down. It will be seen, therefore, that the Rimutaka incline is a terrible handicap to the working of this section of the line. On the average it takes fifteen minutes to marshal the trains at Cross Creek before beginning the ascent, and another quarter of an hour to sort them out at the summit, while the actual climb occupies forty minutes; about an hour and a quarter has thus to be spent on no more than three miles of the journey. In recent years this delay has helped the motor-coach proprietors in their competition with the railways, but the latter have countered their competitors by bringing into force some of the lowest railway fares on record. From Wellington to Masterton, 66 miles away across the Rimutaka Mountains, the fare is now only 7s 6d return to first-class passengers, and 5s second-class, which works out at approximately ¾d and ½d per mile respectively. Plans have been prepared for a deviation of the line through the mountains, to cut out this troublesome section. This would be very costly to carry out; and despite the number of engines and brake-vans and their crews, which have always to be kept at work on the incline, the saving in the cost of working - should the gradient be replaced by one which could be worked with the ordinary locomotives - would only just suffice to pay the interest on the capital cost of building the new line. Although the shortening of journey time would be a great attraction, the idea of a deviation through the Rimutaka Mountains has been shelved for the time being. But some promising experiments have been made with rail cars over this tremendous grade, and it is possible that a solution of the difficulty will be found along rail car lines. Meantime, the New Zealand Government Railways are entitled to boast that they work the heaviest trains in the world over a gradient as steep as 1 in 13. A MAGNIFICENT EXAMPLE of the numerous steel viaducts in the North Island of New Zealand. 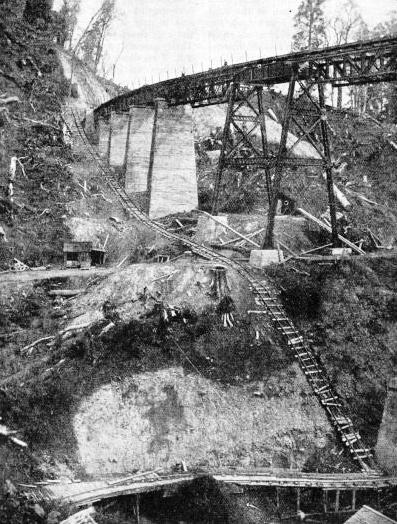 The picture shows the Hapuawhenua viaduct, 222½ miles from Auckland, under construction. The viaduct is 147 ft above the river-bed and has a length of 932 ft. Some remarkable developments are still being made along the principal North Island main line, which connects Wellington with Auckland, 426 miles away. Hitherto, the start out of Wellington has been a steep one. The old line has had to climb from the shores of Wellington Harbour, at the southern extremity of the island, to an altitude of 518 ft, near the suburban towns of Khandallah and Johnsonville, in no more than four and a half miles, before it could descend temporarily to the pretty coastal levels of Parirua Harbour and Plimmerton. This has meant practically unbroken 1 in 36 to 1 in 40 up gradients, as well as a six-mile descent at between 1 in 56 and 1 in 66 from Johnsonville. Many tunnels have had to be negotiated in this short stretch. Two engines have invariably been employed from the Wellington end on all trains. Work also continues, however, on a costly deviation scheme, which will lower the summit level from 518 to 195 ft, flatten the steepest gradient from 1 in 36 to 1 in 100, and reduce the distance by two and a half miles. 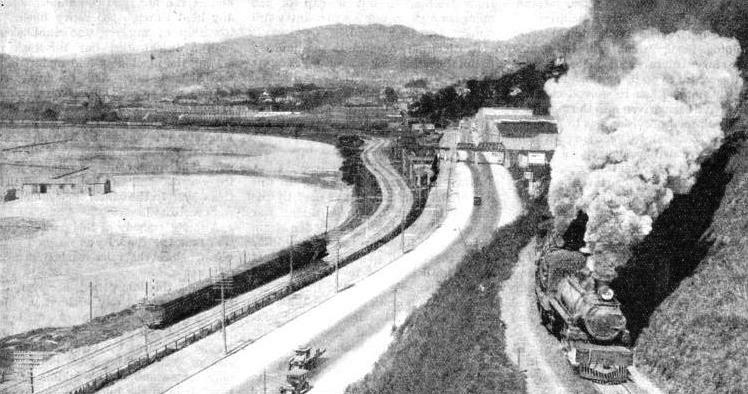 The new line, eight and a half miles long, leaves the harbour a mile farther along the harbour towards the suburban town of Hutt, and dives into a tunnel; there are two tunnels, the first three-quarters of a mile and the second two and three-quarter miles long, with a very short space between them, leading up, with gradients of 1 in 110 and 1 in 122, to the new summit, six and a quarter miles out of Wellington. A run of two and a half miles in the open, falling at 1 in 100, brings the deviation to Tawa Flat, where the old route is joined. Double track is being laid, instead of the single line which is general throughout New Zealand. The deviation is to be electrified, the electrification being eventually carried through to Paekakariki, twenty-four miles from Wellington. To get to Paekakariki another substantial gradient has to be negotiated after leaving Plimmerton. The scenery here is really magnificent. A total of £1,410,000 is being spent on the new alignment, and an additional £277,000 on the electrification scheme. This work is being done purely to expedite and cheapen the main trunk service from Wellington. The heavy haulage up the steep gradients has been a costly business in the past and also has limited the size of trains. This stretch of line (between Wellington and Longburn) was originally owned by the Wellington and Manawater Railway Company, having been completed in 1887. It was purchased and taken over by the government in 1908, the date when through railway communication was established between Wellington and Auckland. Another vast project which is being carried out by the railways of this progressive Dominion is the complete reconstruction, as one new central terminus and harbour station, of the existing Wellington termini - Thorndon and Lambton Stations, which are entirely out of date. The first stage of the work, now complete, has been to reclaim sixty-eight acres of land from the harbour, and to build a new sea-wall along the whole of the harbour frontage. On the land reclaimed an enormous marshalling yard, with loading banks and goods sheds, has been laid out, and here all the railway freight operation of the capital is concentrated. This part of the scheme alone has cost £606,000. Another £80,000 will be spent on a new locomotive depot with up-to-date facilities. LEAVING WELLINGTON. The New Plymouth express toiling up the 1 in 36 gradient from the shores of Wellington Harbour. The express is on the old track, but the trains will use the lower track for a mile farther when the new deviation comes into use. To support the Wellington Station building itself, which will be a fine four-story structure 72 ft high, increased in the centre to 90 ft by the addition of a fifth story, 1,400 reinforced concrete piles have been driven into the reclaimed land. Special provision has to be made in New Zealand to guard against the possible recurring danger of earthquakes. As a precaution against this menace, the piles supporting the station are joined together with continuous ties, and for the same reason the steel superstructure of the building is designed with special jointing. The cost of the new Wellington Station is £350,000. The other improvements, including land reclamation, marshalling yard, locomotive depot, Tawa Flat deviation, and electrification, cost nearly two and three-quarter millions sterling. It was in 1882 that a contract was let for the construction, southwards from Auckland, of what was ultimately to become part of the North Island trunk line. This was the forty-three mile stretch to Mercer, on the Waikato river. 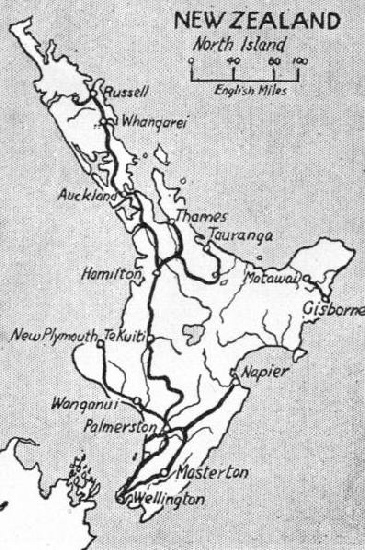 By 1885 some 225 miles of line had been laid south from Auckland and north from Wellington, but a gap of 200 miles through mountainous country still remained to be bridged. South from Auckland, the journey is uninteresting for many miles. At Mercer the line enters the valley of the Waikato, New Zealand’s greatest river, 200 miles in length, coming down from the mountains in the centre of the island to the west coast. Navigable for many miles, it was one of the chief waterways used by the Maoris in their 60 to 80-ft-long war canoes. Now the power of steam sweeps the traveller far more swiftly along the valley. For, going south, it is not until the new town of Te Kuiti has been passed, 126 miles from Auckland, that the first serious climbing has to be faced by the engines. The next twenty miles are a steady ascent, culminating in a long tunnel - 3,515 ft - under the ridge separating the Waipa watershed from that of the Wanganui. Piercing this tunnel was a task of extraordinary difficulty. In order that it might be ready by the time the rails reached it, work was begun in the middle of an un-peopled wilderness, with neither rail nor road communication of any kind through the heavy bush. A township of workers was established, with a brickworks, but the task of getting the machinery and materials to the district may well be imagined. Carters, who worked under contract, had to make their own roads. At some of the worst hills, block and tackle and windlass were rigged up at the hilltop so that when the track was slippery with rain, ropes could be hitched on to the wagons, and the horses assisted in this way. In the winter their difficulties were increased. A minor tragedy of this perseverance was that the tunnel was finished some years before the rails reached it from either side. During this idle period, however, the bore was not entirely without use, for horsemen and packhorses made a practice of passing through it on their way to the King Country, running the risk of getting “bogged” in the stiff clay somewhere in the middle of this black hole in the hills. At this tunnel the railway, 146 miles from Auckland, is 1,128 ft above the sea. TWO ENGINES have to be used to haul trains up the severe gradients - which range from 1 in 40 to 1 in 38 - between Khandallah and Johnsonville. After descending for some thirty miles, the line reaches Taumarunui on the Wanganui river, 478 ft above sea level This descent is made through the so-called “Pumice Country”, which in past ages received layers of ashes from volcanic peaks. Whole cliffs of pumice-stone are seen from the train. washed down from the hills and glistening in the sun. At Taumarunui, 175 miles from Auckland, climbing is begun in earnest. Having left Taumarunui, the North Island trunk line has to climb 2,086 ft in thirty-two miles to Waimarino, which is 2,636 ft above sea-level. The steepest and final stretch of this ascent begins at Raurimu, above which is situated the famous Raurimu spiral. Outside Raurimu Station the line, climbing steadily at 1 in 50, doubles back to the north-west in the first mile, then turns north-east, and then south. Then it describes a complete circle, at the westernmost point of which, although less than a quarter of a mile from Raurimu, it is 200 ft higher up the mountain slope. It continues southward, and having made a final bend to rejoin the valley of the Makaretu river, it passes again within one and a quarter miles of Raurimu, but now at a level 434 ft higher. One of the most remarkable features of this spiral section is that it has been achieved with the minimum of tunnelling. Only two tunnels, one 1,252 ft and the other 315 ft long, have been necessary, together with two short but very lofty embankments across valleys, one 90 ft and the other 100 ft high. At Waimarino the line now continues for more than fifty miles above the 2,000 ft level. Immense mountains are seen on either side of the line, such as the famous Ruapehu, 9,175 ft high and perpetually snow-capped, as well as the active volcano Ngauruhoe. 7,515 ft. Between Auckland and Wellington there are in all twenty-two viaducts ranging in length from 200 to 1,185 ft, and thirty tunnels from 250 ft long up to 3,515 ft.
At Waiouru the railway reaches its highest level, 2,660 ft above the sea, and from here there is a steep incline. A fall of 1,748 ft in forty-three miles represents a difficult rise for trains travelling in the opposite direction. Thus the train gets down, by way of the Rangitikei Valley to Ohingaiti, the southern limit of the difficult mountain section of the main line, which has extended for 110 miles from Taumarunui. Palmerston North, 339 miles from Auckland, fifty-four miles farther on, is the largest inland city in New Zealand. THE HIGHEST BRIDGE IN NEW ZEALAND. 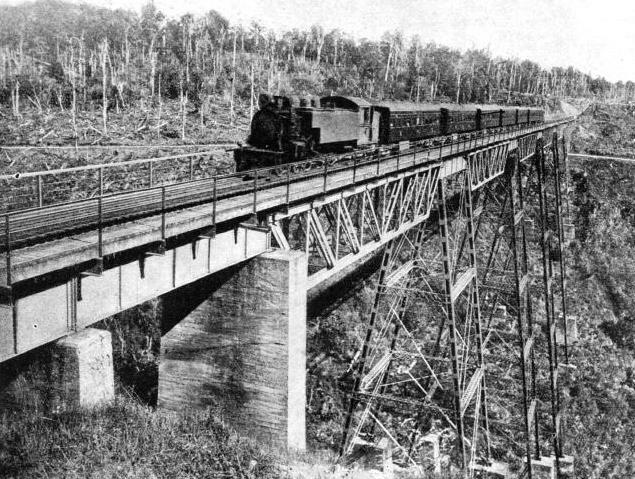 The Wellington-Auckland “Daylight Limited” express is seen crossing the Makatote Viaduct. Just over 212 miles from Auckland, this superb piece of engineering carries the rails 260 ft above the river-bed, and has a length of 860 ft.
You can read more on “Engineering in New Zealand - 2” and “Electrification Overseas” on this website.